It goes without saying that Texas’ culture is heavily Mexican-influenced. It should follow, then, that the Mexican food is out-of-this-world-awesome. Having inspired an entire genre of food (Tex-Mex), the Lone Star State is king when it comes to authentic dishes. Here are the 10 best Mexican restaurants in the state! The Original Ninfa’s on Navigation has been featured in the Houston Chronicle, the New York Times, the Houston Press, on Bravo, and more. The food is Mexican done right, with classics like tamales and fajitas mixed in with more exotic dishes, like the grilled octopus salad. 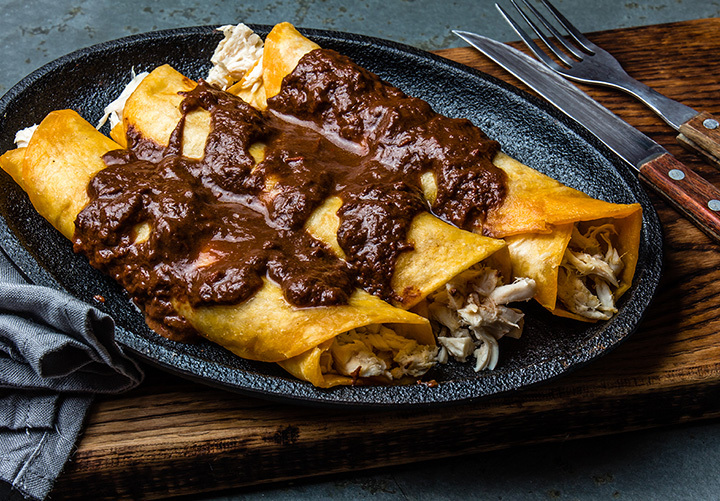 La Fonda on Main serves Tex-Mex fare in a relaxed setting for brunch, lunch, and dinner. We recommend trying the Camarones Al Ajillo (Gulf shrimp, chile de arbol and garlic butter sauce with nopal white rice). El Tejavan in Amarillo, Texas, is known for their excellent taco al pastor. Al pastor refers to tacos filled with meat cooked on a vertical rotisserie, shawarma style. El Tejavan offers grilled beef, cheek meat, marinated beef, marinated pork, fish tacos, and chicken options. For over 30 years, Avila’s has served some of the best Mexican food this side of the border. Guy Fieri visited the restaurant, and it has been featured in numerous publications. The food is “a blend of authentic Mexican cuisine and Tex Mex,” according to their website. Diners from all over Texas come to Corpus Christi to try to take down one of Chaco’s Tacos. Visitors can take part in the Almighty Chaco Taco Challenge, in which they need to eat a 3.5-pound taco. Joe T. Garcia’s is a Fort Worth institution. Opened in 1935, the dishes still use many of the original Tex-Mex recipes. Diners love lounging on the patio while sipping margaritas. Tacoholics in El Paso has been featured on PBS, the Food Network, El Paso Times, and Texas Monthly, among others. Build your own taco or choose from chicharrones, burritos, and more. Mi Tierra began as a three-table café in 1941. Today, it is a world famous Mexican food landmark and seats over 500. Characterized by big murals and delicious food, visitors to Mi Tierra won’t leave disappointed. Mi Pueblo has two locations in Richland Hills, Texas. They’re both cozy, fun places to catch up with friends or family over classic Mexican dishes and drinks. Lupe’s Tex-Mex Grill has a location in Bedford, Arlington, and Keller, Texas. Using family recipes inspired by the owner’s sister, Lupe’s delivers delicious Mexican-inspired food with daily specials.